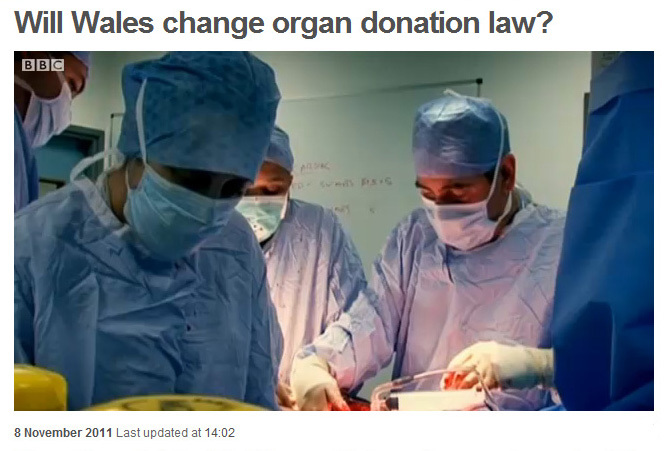 Headline Bioethics: Change to organ donation law in Wales? Clip: Will Wales change organ donation law? Summary of story: The Welsh government’s has published a White Paper Proposals for Legislation on Organ and Tissue Donation: A Welsh Government White Paper in which they outline their intention to change the law regarding organ donation. In keeping with the rest of the UK, Wales current has an “opt-in” system, in which a person has to actively indicate (e.g. by signing organ donor register) that they give consent for their organs to be used by the NHS. Under the proposed system of presumed consent, all adults resident in Wales will automatically be placed upon the register; if anyone wishes to withdraw their consent they must actively remove themselves from the list. Many countries already operate this “opt-out” system; including, in Europe, such countries as France, Spain, Austria, Belgium, Norway and Sweden. In the news coverage, Glyn Davies MP state his opposition to the proposal, highlighting concerns about both the efficacy of the new system, and whether adequate consideration will be given to ethical aspects of the change. Summary of story: In November 2011, The National Institute of Health and Clinical Excellence (NICE) updated its clinical guidance to health care professionals regarding caesarean sections. This update helps ensure “every mum-to-be in England and Wales can request [a caesarean birth].” The story examines the case of Leigh East, who had concerns over a vaginal birth due to a pre-existing back injury. She was initially refused a caesarean section (CS), but was allowed the treatment after her own research persuaded her midwife to allow it. East said, “There was a great deal of pressure initially to not plan a caesarean”. The report continues by covering how women who have had a traumatic experience with natural childbirth in the past should be treated. This includes offering counselling and, ultimately, the option for a caesarean birth if the woman is not reassured. Jenny Clery, Head of Midwifery at Whittington Hospital, said “you shouldn’t force anything on anybody, i.e. go into labour and we’ll see what happens.” The report finishes by stating the new guidelines are there to help women make an inform decision regarding mode of birth (BBC, 2011a). Summary of story: In July 2011 Tom Condliff, a 22-stone man lost his Court of Appeal case for a life-saving gastric bypass operation which had a detrimental impact on his family life and mental well-being (BBC, 2011a). The North Staffordshire primary care trust (PCT) refused to fund the procedure arguing that he failed to fulfil their IFR (individual funding response) policy and his body mass index (BMI) of 43 was below their threshold. He claimed the main reason he gained weight stemmed from drugs that he took for long term diabetes and the procedure was the best solution in order to prolong his life. In August 2011, subsequent to the events in this story, the PCT reviewed his case again and decided to fund his procedure as they now saw his case as an exceptional circumstance (BBC, 2011b). After having the operation, Condliff was reported to have lost six stone (Doward, 2012). You are currently browsing the archives for the Headline Bioethics category.